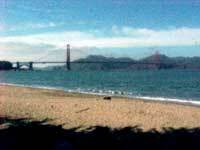 The Crissy Field locations in the San Francisco Marina area have views of the Golden Gate Bridge. 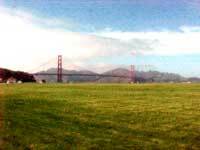 View our video of Crissy Field. Crissy Field is located at the very edge of the San Francisco Bay and offers magnificent views of the Golden Gate Bridge, the Marin Headlands and Angel Island. Of Note Once an Army airfield and Presidio motor pool, this former stretch of barbed wire and pavement has been restored as a pristine urban park and wetlands. Receptions No space for receptions. There are many indoor reception facilities nearby in the Presidio of San Francisco (use sidebar link to Reception Facilities). Restrooms Restrooms available at the East Beach parking area. Parking Available parking is limited, often crowded and is not guaranteed. Arrangements can be made to reserve parking space in the Presidio by calling the Presidio Trust Events office at (415) 561-5444. Accessibility This site poses some difficulties for visitors with disabilities. Restrictions The Wildlife Protection Area, encompassing the torpedo wharf eastward to approximately 700 feet east of the former Coast Guard Station, is off limits to special events. Please also read park regulations and permit conditions for weddings. Directions From Freeway 101 Traveling South or 19th Avenue/Highway One Traveling North: Follow signs for 101 South/Lombard Street. Follow Lombard Street to Van Ness Avenue and turn left. Follow Van Ness north until you reach Bay Street and turn left. See “Directions Continued” listed below. From Freeway 80 Traveling West: Follow signs for Freeway 101 North/Golden Gate Bridge. You will exit onto Van Ness Avenue. Follow Van Ness Avenue several miles north until you reach Bay Street and turn left. See “Directions Continued” listed below. Directions Continued: Follow Bay Street to Laguna. Turn right on Laguna and follow the road as it curves past the Marina Safeway shopping center and turns into Marina Drive. Follow Marina Drive, approximately two miles to the Marina Gate entrance into the Presidio. Crissy Field will be on the right hand side of the road. Terry Plank is available as a wedding officiant in the San Francisco Bay Area..